Anywhere cold air blows on a pipe, it creates the potential for freezing. To make sure your pipes are well-insulated, close crawl space vents and stuff insulation over the openings. Even a tiny hole can let a lot of cold air blow in; make sure you fill in all the cracks. A bathroom or laundry room located above or next to a garage can be particularly vulnerable, so keep the garage door closed to maintain maximum heat. If your bathroom pipes run along an outside exterior wall, try keeping the vanity door(s) open to allow heat inside. If you’re anticipating a deep freeze, consider using a fan to help circulate the air near the pipes, or purchase a small space heater for some extra temporary heat. If the overnight temperature is expected to drop below freezing, letting your faucets drip overnight will eliminate some of the pressure that builds up in your home’s pipes. As a result, pipes are less likely to burst, even if they do freeze. Finally, never turn off the heat when you leave home during the winter. Instead, set the temperature to at least 55 degrees F (higher if you’ve had problems in the past or live in an area of extreme cold). If you have multiple heat zones, be sure to adjust all thermostats appropriately. Disconnect and store garden hoses. If your home has a separate shut-off for external faucets, turn it off and drain the water from those faucets. Turn off and drain sprinkler systems. You may want to call in a professional company to blow out any leftover water in the underground lines. A broken sprinkler pipe can do damage to the delicate components that make up the entire system, increasing the cost of repair. Insulate exposed pipes with insulation sleeves, wrapping or slip-on foam pipe insulation. Do not leave any gaps without insulation as cold air can affect the pipe in these spaces. 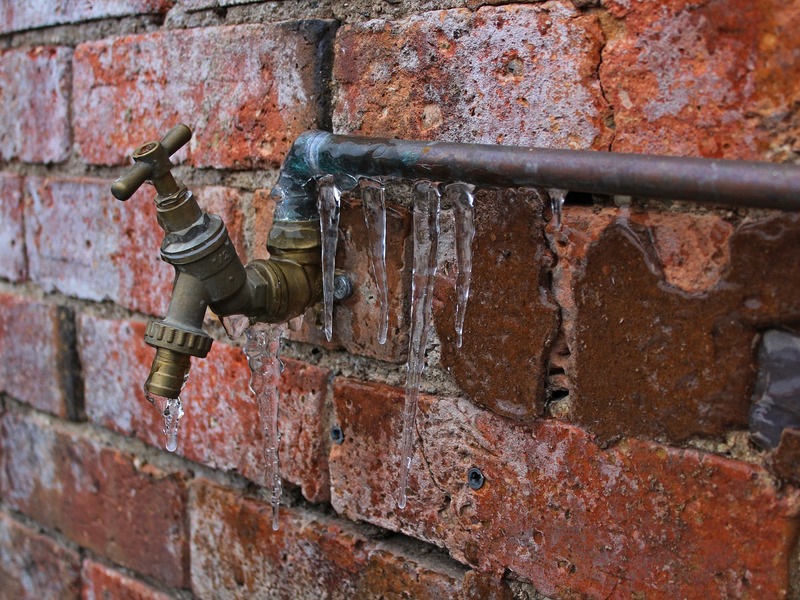 Plastic piping is more tolerant of freezing than old copper or steel water pipes. Know where your main waterline shut-off is before problems arise. Depending on the age of your house, it can be inside a garage, basement or laundry room, or underground in your yard. After turning the water off, turn on faucets to allow the water to drain and release the pressure in your pipes. You turn on the faucet but nothing comes out. Look in the most likely places and gently thaw the area. Whatever you do, do not use a blowtorch to warm up a frozen pipe. Many homes have been set on fire this way. The water is turned off but you hear rushing water running anyway. This could be a sign that you have a leak somewhere. You should turn off the water lines immediately and investigate.